A documentation of our achievements, challenges, dreams for the forthcoming year and sincere gratitude to our donors and supporters. 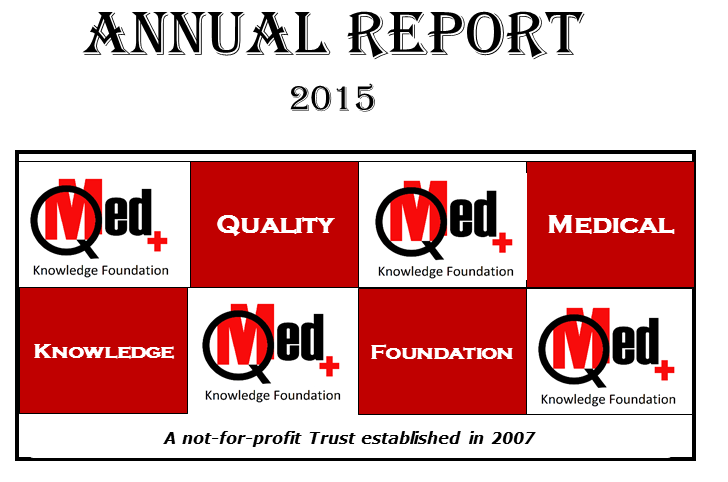 Welcome to the Eighth Annual Report of QMed Knowledge Foundation! This year we experienced the feeling of “the break of a dawn and lights beginning to glow” as several of our dreams are coming true. One of our major dreams and priorities is for Undergraduate students of medicine (and health sciences).This year, we conducted seven workshops for this group! We wanted to raise our levels of help to assist Systematic Reviewers and Guideline developers. We worked with three such teams (one – an international group)! QMed’s dream is to see that every human takes responsibility for his or her health by understanding what works best to stay healthy and to manage diseases or health conditions. Doctors and health professionals need to know how to find the best evidence, and then use their clinical learning, expertise and judgment, along with the best evidence, to treat patients. Consumers and patients also need to learn how to find the best evidence and then discuss their treatment options with their doctors. Doctors and consumers should ideally work together, using the best available evidence to make decisions. 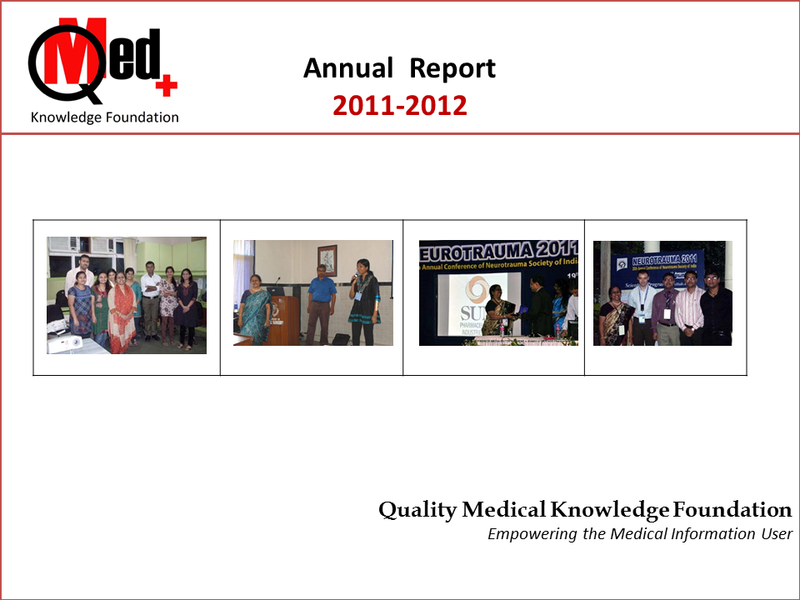 This year was very special for QMed, as we completed five years in December 2012. The five years have been a period of steady growth and achievements. Having delivered around more than 100 lectures and also detailed workshops, on searching for literature and evidence, to an audience of more than 8000 health professionals and students, we feel poised to reach out to a much larger target. During this year, we took stock of the situation and did a lot of important activities, as well as planning. 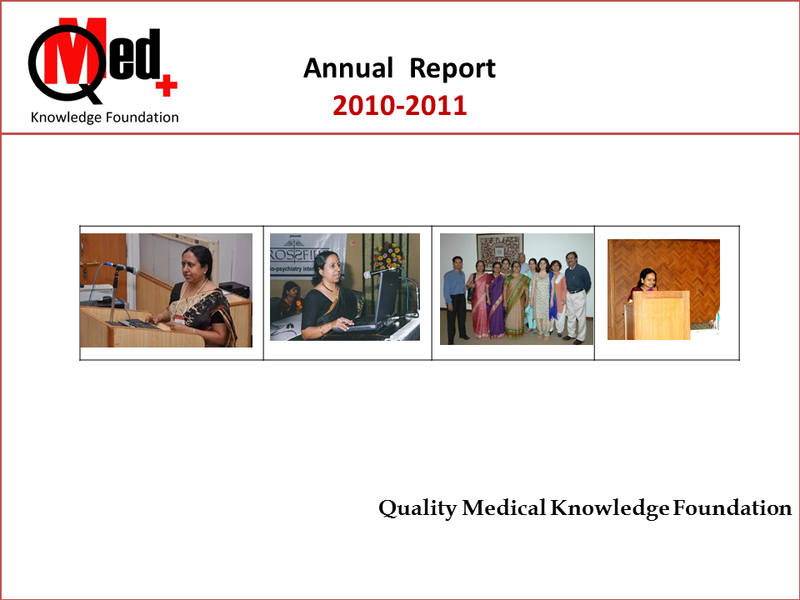 I am happy to present to you the Annual Report for the third Financial Year of operations. While we continued to do several workshops and lectures, there are certain highlights of this year that I would like to share. We did preconference workshops in two Undergraduate Student Conferences. We always accept such requests because we believe that if we educate this audience today, they will evolve into better health professionals. I presented a poster at the Annual Cochrane Colloquium this year (held in Madrid, Spain) and again went through several learning opportunities which will translate into better learning for our friends in India. 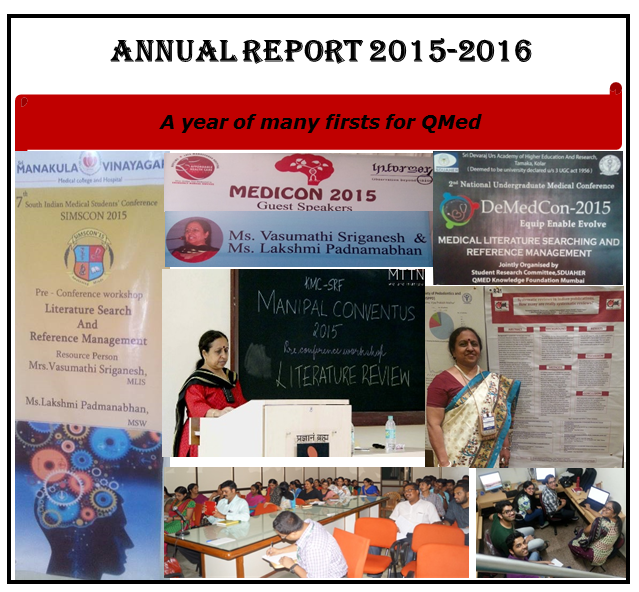 This year we have trained more than 1500 people. We have conducted around 50 training programs & lectures for PubMed, Cochrane Library & UpToDate across the country in various cities like Ahmedabad, Ambala, Bangalore, Calicut, Chandigarh, Chennai, Dehra Dun, Hyderabad, Kalwa, Kanpur, Khandala, Mumbai, Nagpur, Patna & Pune. I am happy to share with all of you that in the second year of our establishment and work, we have scaled up our lectures and workshops to a good number, reaching out to nearly 1000 students & professionals with these. Nothing of course is “enough” for us, but we can move step by step, since our work depends on funding as well as the cooperation and participation from institutions. 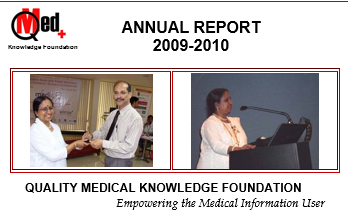 Two very important achievements this year are that I received a partial fellowship to attend the International Congress of Medical Librarianship in Brisbane Australia, an event where I get to learn lots more to come and share out here; and I was selected as an “investee” by UnLtd India – an organization that coaches Non-Profit Organizations to reach their full potential. Both these achievements this year, I am sure will do a lot to help us at QMed change things for you!